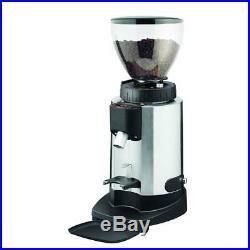 Refurbished Ceado E6P Electronic Dosing Burr Grinder. Ceado’s mantra has always been to think strong and work better, a philosophy that played a large role in the design of their E6 Timer grinder. Under 20 tall, the E6’s compact design belies its high performance components and features that allow it to keep pace in commercial environments, even with two group machines. Like all Ceado grinders, the E6 is NSF approved, making it suitable for both home and commercial applications. For their doserless model, the E6P, Ceado has taken their intelligent design one step further with the adjustable portafilter catch. Mounted on the front of the machine, the portafilter catch can be raised or lowered to accommodate portafilters of varying sizes and heights. For truly hands free operation, the catch is built with a small lip that actually locks the portafilter in place while grinding, eliminating the need to hold it in place while your coffee is dispensed. As an electronic grinder the E6P features two time programmable dosing buttons for both single and double shots. Perhaps the most important innovation of the E6 series is Ceado’s Steady Lock system. The Steady Lock system is designed to maintain a fixed distance between the burrs while grinding, even while under high stress. This helps to ensure particle consistency by preventing the burrs from falling out of calibration. Grind adjustment is stepless, allowing for a near infinite number of grind settings and burrs are 64mm stainless steel discs. In the event that user error, or some form of external element would impede the grinder, the E6 is fitted with overload protection safeguards that cut power to to prevent overheating and damage to the motor. Lastly, a design consideration that will most apparent to home users is the scaled down size of the E6 when compared to other grinders of similar capability. With durable yet lightweight alloy housing, the grinder weighs approximately 21lbs and measures 8.66″ W x 14.17″ D x 19.5 H. At last Ceado has created a high performance, compact grinder to compete in the home and commercial sectors. Whatever you do, don’t call it mini. “Dimensions: 14.17″ D x 8.66″ D x 19.5″HWeight: 24.2lbsHigh Capacity Overload ProtectionIn order to ensure high-performance in commercial environments, the grinder has been fitted with overload protection safeguards that prevent accidental blocks caused by external agents or operating errors. Durable Lightweight HousingThe E6 P uses lightweight alloy housing and a polycarbonate hopper. The machine is guaranteed for 3 years and the grinder spring is guaranteed for life. Steady Lock GrinderCeado’s Steady Lock system is designed to keep a constant distance between the burrs under any working stress conditions. This ensures grinding consistency by preventing the burrs from falling out of calibration. Two Adjustable Dosing ButtonsThe E6P features two adjustable coffee dosing buttons, one for a single shot and one for a double shot. The amount of coffee dispensed for each button can be adjusted individually via adjustment screws located on the front of the grinder. Dimensions: 14.17″ D x 8.66″ D x 19.5H. High Capacity Overload Protection. In order to ensure high-performance in commercial environments, the grinder has been fitted with overload protection safeguards that prevent accidental blocks causéd by external agents or operating errors. The E6 P uses lightweight alloy housing and a polycarbonate hopper. Ceado’s Steady Lock system is designed to keep a constant distance between the burrs under any working stress conditions. Two Adjustable Dosing Buttons. The E6P features two adjustable coffee dosing buttons, one for a single shot and one for a double shot. The item “Refurbished Ceado E6P Electronic Dosing Burr Grinder” is in sale since Friday, August 31, 2018. This item is in the category “Home & Garden\Kitchen, Dining & Bar\Small Kitchen Appliances\Coffee, Tea & Espresso Makers\Coffee Grinders”. The seller is “wholelatteloveoutlet” and is located in Rochester, New York. This item can be shipped to United States.